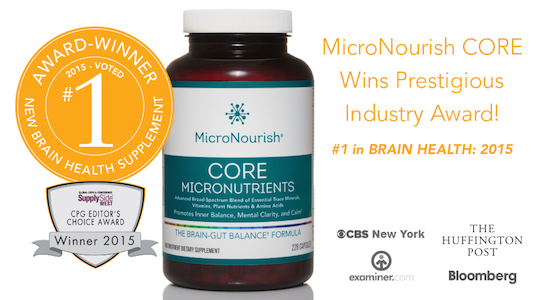 Las Vegas (Oct 7, 2015) — MicroNourish Core was today announced as the winner of 2015 SupplySide CPG Editor’s Choice Award for Brain Health and Mood. The SupplySide editorial team awarded achievements in consumer packaged goods (CPG) for innovation and market impact across 18 different categories. The Brain Health Award was introduced this year. A growing body of research indicates that micronutrients are important for mood stability and focus, and that healthy brain-gut balance is pivotal in maintaining mental wellness and balanced eating. That is why MicroNourish Core addresses micronutrient absorption, the brain-gut connection, and digestion, together. MicroNourish Core provides premier micronutrients in one powerhouse daily supplement that’s easy to remember. Since You Are What You Absorb®, the nutrients are blended for maximum absorption and assimilation by the brain and body. Winners of the CPG Editor’s Choice Awards were announced in an Awards Presentation at SupplySide West 2015, on October 7 at the Mandalay Bay Resort in Las Vegas, Nevada. For nearly 20 years, SupplySide has helped dietary supplement, food, beverage, animal nutrition, personal care and cosmetic professionals find information to explore, discover, innovate and market their next best-selling product. 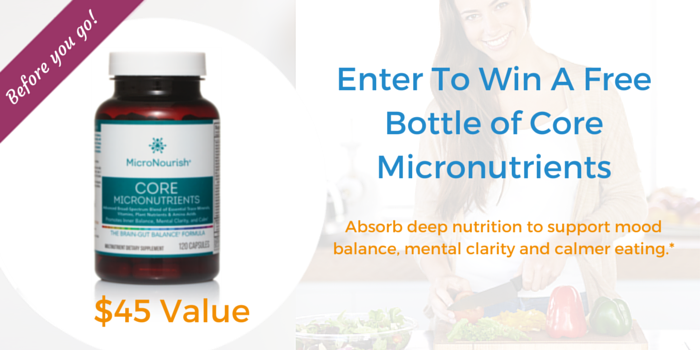 MicroNourish Core includes high-performance minerals, bioavailable vitamins, brain-supporting amino acids, and absorption-enhancing botanicals – to feed the brain and nourish the gut* – in one powerhouse daily supplement that’s easy to remember. Leverages mounting research linking micronutrients to improved mental well-being* – including a broad-spectrum of trace minerals like selenium, chromium, molybdenum and iodine. 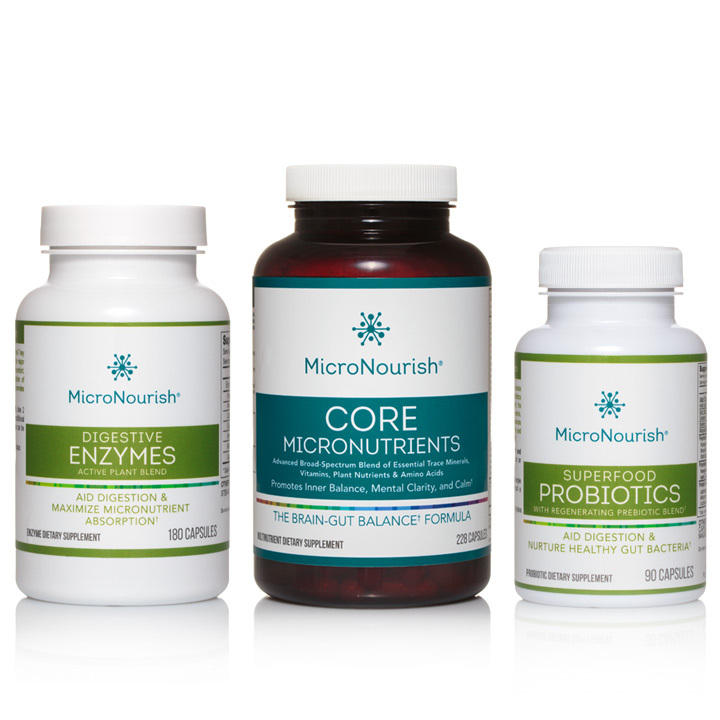 In summary, MicroNourish Core makes mental wellness accessible and achievable by bringing a mounting body of science on micronutrients to a new wave of empowered consumers who understand that quality micronutrition fuels their brain, that gut health matters, and that bioavailability and quality can make all the difference when it comes to their state of mind. MicroNourish Core is an award-winning product because it combines real-life practical successes with cutting-edge science in a solution tailored for a modern consumer on the go. Hosted by Informa Exhibitions, this annual tradeshow and educational forum is the largest expo of suppliers fueling the healthy global marketplace. SupplySide West is all about the exploration, discovery, innovation and marketing strategy around the development of finished consumer goods that drive the global business economy. The 2015 show was held October 5-9 at Mandalay Bay in Las Vegas. For more information and for future SupplySide events, please visit www.supplysideshow.com. For more information about SupplySide West, visit supplysideshow.com.